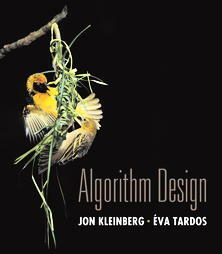 Welcome to the Fall 2010 version of the Introduction to Algorithms Course! 10/28. Yizhen (Andrew) Huang is no longer a TA for this course. Please see the updated staff schedule here. 9/17. There are two corrections on homework 1: (1) in problem 2, m and M refer to the same number; (2) the extra credit question refers to problem 3, and not to problem 2. 9/8. **MIDTERM DATES** The midterm will be held on Monday Oct 25 at 7:15 p.m. For those that cannot make it at this date/time, a make-up exam will be held on Friday Oct 29 at 7:15 p.m.
9/3. A poll has been set-up here to schedule the midterm. Please respond to this poll by September 5th. This is a hard deadline. Please mark *all* the dates that work for you. 8/30. Please check this space frequently for updates. See you on September 3.